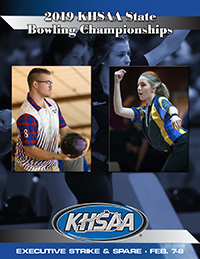 The lane assignments for the 2019 State Bowling Championships have been posted on the KHSAA website. Coaches and participants should review all materials on the KHSAA website under the State Information and Instructions tab, which includes links to the state instructions, time schedule, hotel information and much more for the 2019 KHSAA State Bowling Championships. Please contact Sarah Bridenbaugh (sbridenbaugh@khsaa.org) should you have any questions.